The number of seniors being abused has increased in recent years, with most perpetrators being their own family members, a government report showed. 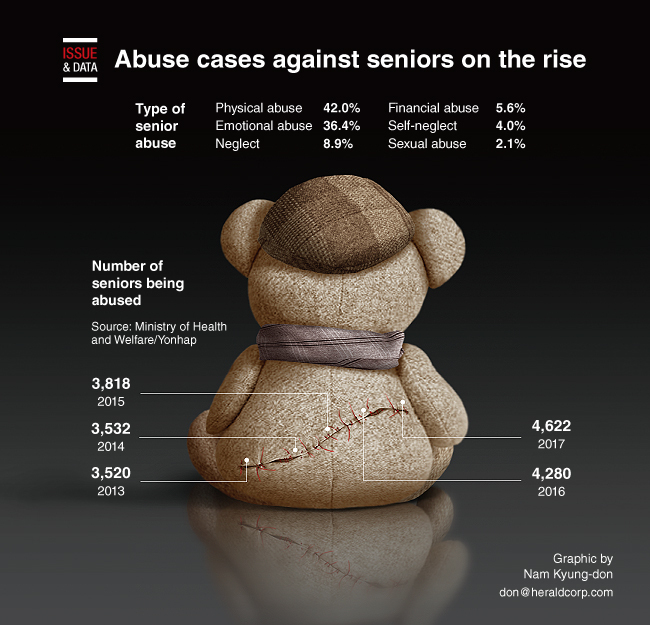 According to the annual report by the Ministry of Health and Welfare, there were 4,622 cases of abuse carried out against seniors in 2017, up 8 percent from a year earlier. The findings showed that most of the assaults were committed at home. The number has steadily increased from 3,502 in 2013, 3,532 in 2014, 3,818 in 2015 to 4,280 in 2016, the ministry said. Of the total, 3,460 victims were women and 1,612 were men last year, with those suffering dementia accounting for 24.3 percent of the total victims, the report showed. Among the victims, 1,536 were living with their grown children and another 26.3 percent with their spouses, the report showed.